Lake Arrowhead may conjure up images of Oktoberfest celebrations, camping, and boating for most, but for area native Vic Leader, the Lake Arrowhead area is both home and “woodlot.” After wildfires in 2003 decimated over 90,000 acres in the San Bernardino Forest, including hundreds of homes in the Lake Arrowhead area, California and the U.S. Forest Service realized the need for increased forest care. Standing dead trees from the ever present bark beetle, disease, and old fires provide excellent fuel for wide sweeping devastation like the “old fire” of 2003. Wanting to avoid another catastrophic event, the U.S. Forest Service, local County Fire, Fire-safe Councils, and other groups began working with local timber contractors to thin the forest and increase its general health and resistance to future forest fires. Vic Leader had been working for the BNSF Railroad for several years when he noticed the volume of logs for transport increasing. He learned the increase was due to a new effort to improve the health of the San Bernardino Forest. a GMC c8500 hooklift/rolloff truck with (3) 30 yard bins. Not to mention, the custom milling division has both an 8” Lucas walk-along and a Wood-mizer LT-70 portable band sawmill. 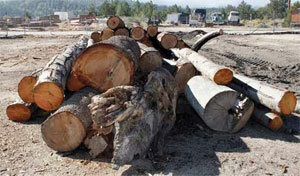 Although beetle and fire kill can often have a blue stain, which is undesirable at commercial mills, pallet and other select sawmill markets can be found that pay the same as green trees. Thinning projects in the area are typically aimed at removing smaller trees to allow existing trees to mature to their full potential and reduce forest fire fuel. According to foresthealth.org, selectively thinning 30 percent of trees in an unhealthy forest like the San Bernardino Forest will eliminate 93 percent of future tree death and reduce the potential for catastrophic fire. When thinning for commercial purposes, the difference between a 40-year-old tree in a properly thinned forest and a 40-year-old tree in an unmanaged forest is dramatic. Depending on species, there can be a 15-25 percent increase in crop tree diameter, and the net stand value per acre can increase by as much as 600 percent. In addition to removing smaller trees, an important part of improving forest health, especially in the San Bernardino Forest, is the removal of standing dead trees. The majority of the dead wood Vic and his crew harvest results from fire and beetle kill. Years ago, when Arrowhead Enterprises first began contracting to perform forest management, the view from Arrowhead Enterprises’ log yard (dominated by a forested mountainside next to Lake Arrowhead) wasn’t so beautiful, being littered with significant amounts of dead and dying trees. This was a situation that could fuel another catastrophic forest fire. Arrowhead Enterprises and other timber companies were contracted to strategically remove excess timber in order to restore forest health. Today, the results are dramatic. Gone is the rusty brown of dead and dying timber, and in its place is a healthy, green, fire-resistant forest. Much of the forest Vic and his crew work is within the Lake Arrowhead watershed. Environmental concern over thinning and harvest work can mostly be avoided with the use of helicopters. With heli-harvesting, fewer road miles are built reducing impermeable surface and associated runoff, and significantly less heavy equipment is operated on the forest floor. Other benefits to heli-harvesting include the ability to easily remove select logs such as standing dead while leaving healthy trees standing, and the fact that the helicopter simply lifts the stem without contacting the ground can reduce soil impacts. In addition, where there are steep slopes, rocky terrain that may damage wood when felled, or sensitive structures such as a pipeline or homes, using a helicopter to harvest may allow for the retrieval of logs that were simply inaccessible with traditional on-the-ground methods. The caveat to helicopter harvest is its high operational cost. Vic says that subcontracting a helicopter on over different 20 projects has taught him how important thorough bidding is. Understanding the lay of the land, identifying appropriate landing areas, knowing the flight paths to avoid dangerous situations such as residential development, and correctly estimating the amount of time to fly the job are critical for profitable bidding with helicopter work. Arrowhead Enterprises is the custom milling end of the operation and Vic intends to mill more of his logs than in the past. 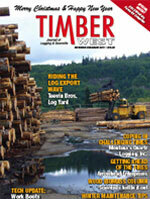 Currently, around 90 percent of the timber comes from fire or beetle kill that’s standing dead. Another important profit center for Arrowhead Enterprises is the custom milling end of the operation. Vic had always been interested in woodworking and although it’s fairly uncommon for a logging operation to also mill custom wood, the combination allows Arrowhead to retain the absolute highest quality wood for their own product and avoid the very expensive transportation costs of today. 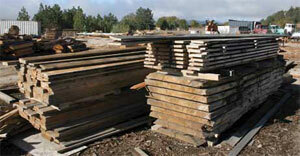 Arrowhead’s milling operation offers premium, eco-friendly, custom wood for the local market. Because upwards of 90 percent is from fire or beetle kill standing dead and the remaining from thinning, Arrowhead is able to reduce deforestation in other areas. The workhorse of the operation is the Wood-mizer LT-70 portable band saw. The very thin blade kerf allows the maximum amount of board feet to be produced out of every log at any custom size the job may require. Occasionally a tree may be of too large a diameter so Arrowhead also has a Lucas walk-along circle saw that can quickly rough or slab out big material. Arrowhead is able to produce a wide variety of product with these two mills including house log materials, high grade natural edge siding, specialty slabs for mantels, tables, benches, and custom or standard dimension lumber. Although beetle and fire kill can often have a blue stain that commercial sawmill markets penalize sellers for, pallet and other select sawmill markets can be found that pay the same as green trees. When custom milling wood, the blue stain is typically a non-issue or when utilized properly, can often enhance a project giving the wood a unique look many customers appreciate. 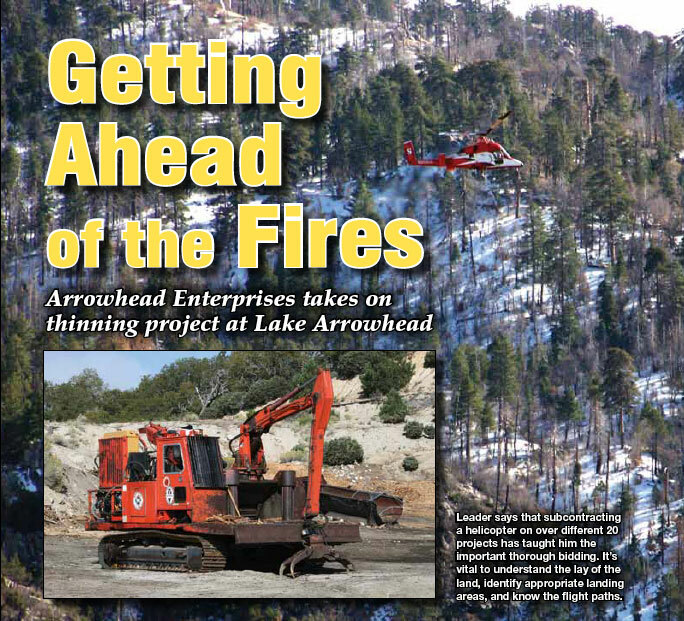 Arrowhead Enterprises has contributed to the improvement of the San Bernardino Forest’s health in the Lake Arrowhead area. Thinning and removal of standing dead will continue to be a part of that work in the coming years to ensure continued safety from large scale fires. For now, Vic intends to mill more of his logs than in the past. Providing locally harvested and milled lumber to the local market is a good example of putting wood to its highest and best use in a way that reduces costs for everybody.